Lehman Brothers (LEH) went bankrupt, Bank of America (BAC) made an offer for Merrill Lynch (MER), and American International Group (AIG) was given an $85 billion loan in exchange for being nationalized. All this came on the heels of the nationalization of quasi-government entities Freddie Mac (FRE) and Fannie Mae (FNM). The Merrill Lynch buyout looked terrible for Bank of America, and its stock was pummeled. When announced, the deal valued Merrill at $29 a share. Since it was an all stock deal, and BAC's stock was falling, MER traded between the high teens and low twenties. The deal falling through was seen as a "calamity" for Merrill. Then it was announced that the government had a bailout plan. Some sort of dump would be created for all the banks to shovel their garbage into. The SEC prohibited short selling of financial stocks. For about a day and a half, the markets soared. Rupert Murdoch called it "a government-imposed short squeeze." Merrill Lynch closed at $29.50 on 9/19/08. Now there's talk that Bank of America got a great bargain, and it might be better for Merrill that the deal doesn't happen. How quickly things change in this crazy market. 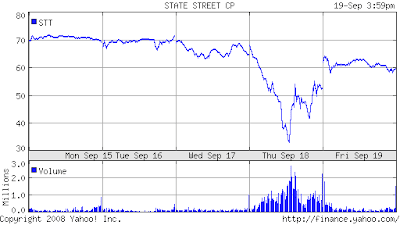 As another example of the craziness, take a look at how State Street's (STT) stock traded. It opened the week at over $70 per share. Mid Thursday, it was below $30. It closed the week above $60. As the market was tanking until Thursday's announcement, three month Treasuries were in such high demand that their yield was negative for a brief period. Investors were willing to lose money in treasuries than to stay in stocks. The subprime crisis turned into a credit crisis, which spiraled out of control. Treasury Secretary Paulson's briefing "on the catastrophic potential" of the crisis "shocked [lawmakers] into uncharacteristic silence." If the government does not bailout the financial system, it is said, there won't be much of a financial system left. So it appears that the sky really is falling. The proposed bailout, whose price tag Barclays estimates at around $700 billion to $1 trillion, has the government and government sponsored entities buying mortgage backed securities from financial institutions with headquarters in the US. While most agree that a bailout is necessary, there is already some wrangling in congress, with Democrats wanting to attach things like a stimulus and unemployment benefits to any bailout legislation. Depending on the level of bickering and posturing, it may take weeks before there's anything for Bush to sign into law. There are lots of questions. How will the mortgage backed securities be valued? What happens to all the non-mortgage crap like CDOs and SIVs? What happens to financial institutions not headquartered in the US? What's going to happen to the sovereign debt rating of the US? What of the moral hazard risk (the message seems to be if you're going to be greedy and reckless, make sure you take the world down with you if you want a bailout)? Will anyone be jailed? Will the credit rating industry (Moody's, Fitch, S&P), which bears a lot of responsibility for the current mess, be reformed? Are we now setting up the next boom and bust? Many banks are still expected to fail, the number depending on how the mortgage backed securities end up being valued. Some economists say a recession is unavoidable (but I thought we were already in one?). Nouriel "Dr. Doom" Roubini, an NYU economics professor who was laughed at in 2006 for his predictions, is now the go to guy. He says the bailout, if it works, will shorten the coming recession to a year and a half. Clement Gignac, Canada's National Bank chief economist, predicts the US will have a severe recession that will last a year. If these two and others of a similar view are correct, the recent stock market rally may be short lived. Stocks usually begin to rebound about six months before the economy does. If a recession is going to last another year, stocks may still head lower. Being a mostly long term investor, I'm not selling my General Electric (GE), Johnson & Johnson (JNJ), Philip Morris International (PM), or Procter & Gamble (PG) stock. While it's now tempting to buy financials, particularly their high yielding preferred shares, I'm going to sit out. Those long term investors who invest a portion of their income on a regular basis should probably continue to do so. Disclosure: At the time of writing, I own GE, JNJ, PM, and PG. Additionally, I own pretty much worthless MER puts (but a lot can go wrong between now and January). I hope the puts stay worthless.